“We can’t have a reception honoring Ken without music,” said Professor Joan Griffing at a May event marking the retirement of her music department colleague Ken J. Nafziger. Nafziger stepped to the front of the crowded room and, as he has for countless times over the last 40 years, asked his Eastern Mennonite University (EMU) colleagues to sing. This time, it was “Amazing Grace,” the first two stanzas together and then the first stanza in rounds. Then he asked for the second stanza “slow and in harmony,” and gestured for the final line to be drawn out: And grace will lead me home. Nafziger arrived at EMU in 1977, after undergraduate studies at Goshen College and graduate studies at the University of Oregon, where he completed his DMA in 1970. He was a post-doctoral conducting student at Staatliche Hochschule für Musik in Germany and then taught at the University of Minnesota. Besides teaching duties and leadership of vocal ensembles, Nafziger contributed to the form and shape of such EMU curricular distinctives as the Honors Program, senior seminar and the cross-cultural program. 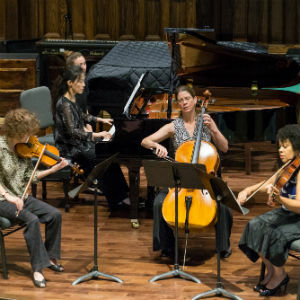 Twenty-five years ago, Nafziger founded the Shenandoah Valley Bach Festival, an annual event hosted by EMU that draws musicians and listeners from around the country. The silver anniversary event, previewed here, is June 11-18. Many musicians return year after year. In a 2014 Crossroads magazine article, musician Sandra Gerster shared sentiments that have commonly expressed since about working with Nafziger. She has joined the festival from her home in Baltimore, Maryland, since 1983. For his varied endeavors, including leadership of the independent chamber ensemble Winchester Musica Vivica, Nafziger was awarded the 2015 Circle of Excellence in the Arts Award. The honor recognizes “outstanding accomplishments and sustained contributions in the arts, improving the cultural vitality of the Shenandoah Valley.” The award was given by the Forbes Center for the Performing Arts, the Valley Arts Council, and the College of Visual and Performing Arts at James Madison University. Nafziger’s unique way of creating community through music was noted by several speakers at the reception, including colleague James Richardson.In church music, Nafziger’s influence has been both national and international in scope. He was the music editor of Hymnal: A Worship Book, popularly known as the “blue hymnal,” published in 1992, used in Mennonite churches across the United States, and assistant editor to two auxiliary Mennonite hymnals, Sing the Story and Sing the Journey. Read on for more memories of Professor Ken J. Nafziger, shared by former students and colleagues, and share your own in the comment box at the end of this article. Braydon Hoover, a former Chamber Singer, offered this introduction before the Chamber Singers alumni sang “Dona Nobis Pacem” by Johann Sebastian Bach at the October 2016 Homecoming and Family Weekend worship service. As many of you may already know, Ken J. Nafziger is retiring at the end of this academic year after more than 40 years and innumerable lives transformed here at EMU. Yesterday, over 50 Chamber Singers from each of those decades reminisced about our experiences singing under his direction. The responses ranged from the humorous to the sacred and more than a little of both. One person recounted a program error that stated, without any punctuation that the next song would be “Under the shadow of the almighty conductor Ken Nafziger.” Another told of a moment of transcendence, weeping as the music we made together washed over him. And by the end we had all graduated in the same year. That time of sharing could have gone on the rest of the day, but we couldn’t very well all be together in one place and not sing. The next song we’ll be singing is Dona Nobis Pacem by Johann Sebastian Bach and while it wasn’t sung every year, it has particular themes and threads that link Chambers Singers from 1977 to 2017. Just as Bach transformed the world with his music, so to has Ken in this space, in this time, in this community. Ken and Helen, Dona Nobis Pacem translates to Grant Us Peace and from all of your Chamber Singers past and present we wish you both peace in this next chapter of your lives.